Gene set enrichment approaches have been increasingly successful in finding signals of recent polygenic selection in the human genome. In this study, we aim at detecting biological pathways affected by positive selection in more ancient human evolutionary history, that is in four branches of the primate tree that lead to modern humans. We tested all available protein coding gene trees of the Primates clade for signals of adaptation in the four branches mentioned above, using the likelihood-based branch site test of positive selection. The results of these locus-specific tests were then used as input for a gene set enrichment test, where whole pathways are globally scored for a signal of positive selection, instead of focusing only on outlier “significant” genes. 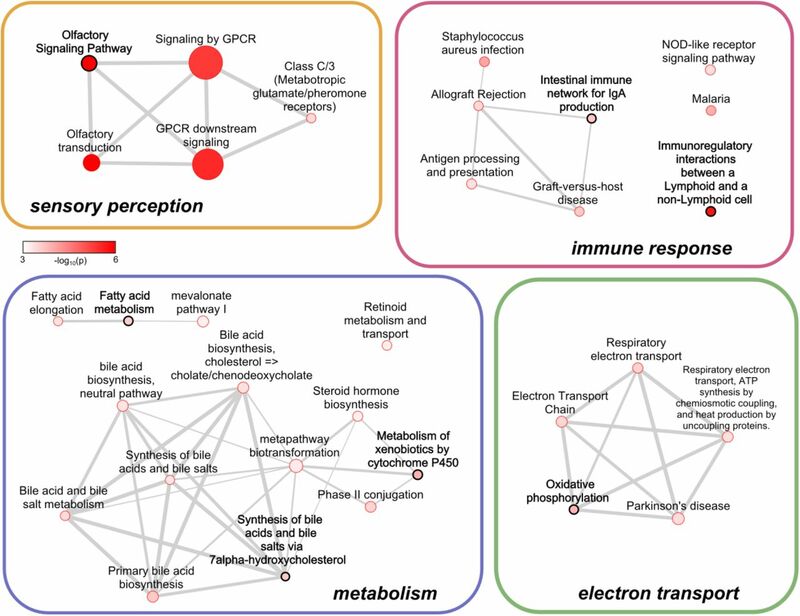 We identified several pathways enriched for signals of positive selection, which are mainly involved in immune response, sensory perception, metabolism, and energy production. These pathway-level results were highly significant, at odds with an absence of any functional enrichment when only focusing on top scoring genes. Interestingly, several gene sets are found significant at multiple levels in the phylogeny, but in such cases different genes are responsible for the selection signal in the different branches, suggesting that the same function has been optimized in different ways at different times in primate evolution. An important challenge in the study of protein evolution is the detection of substitutions fixed by positive selection on a background of genetic drift and purifying selection. The detection of such positive selection signal has progressed thanks to better codon models and statistical tests (Delport et al. 2009). Yet these tests suffer from low power (Anisimova and Yang 2007; Gharib and Robinson-Rechavi 2013), especially when they are applied to closely related species, where phylogenetic trees only have relatively short branches with few descending sequences. The situation is worse when positive selection is weaker, and thus harder to detect, e.g. in species with small population sizes. If cumulated, these effects make it notably difficult to reliably detect positive selection in recent primate evolution, such as on the phylogenetic branches directly leading to humans. Despite these inherent limitations, there is much interest in detecting positive selection in humans and in the primate evolution which led to our lineage (Lachance and Tishkoff 2013). For example, as soon as the chimpanzee genome was available, genome-wide scans using codon models were performed, resulting in the detection of fast evolving genes related to immunity, host defense, or reproduction (Chimpanzee Sequencing and Analysis Consortium 2005; Nielsen et al. 2005). However, these genome scans often lacked power to distinguish positive selection from relaxed purifying selection. With more species (i.e., more data) positive selection was eventually detected, but very few genes remained significant after correcting for multiple tests (e.g. Bakewell et al. 2007; Gibbs et al. 2007), and thus only those genes with mutations of very large effect were identified. While these limited results are interesting, a more comprehensive picture of positive selection in the evolution of the human lineage still remains to be uncovered. Here we propose to combine potentially moderate signals from several genes to gain statistical power, using biologically meaningful groupings of genes, such as known regulatory and metabolic pathways. Indeed, several genes with small effect mutations can altogether have a large impact on a biological pathway, even though these genes would have little chance to be identified by conventional genome scans. An increasing number of studies has thus shifted the focus from single gene approaches to the detection of polygenic selection (e.g. Serra et al. 2011; Daub et al. 2013; Fraser 2013; Berg and Coop 2014; Carneiro et al. 2014; Wellenreuther and Hansson 2016), taking advantage of existing databases of gene sets and pathways. For example, we have used a gene set enrichment test to detect gene sets with polygenic adaptive signals in human populations (Daub et al. 2013), showing that most significant pathways for positive selection were involved in defense against pathogens. This procedure has also been successfully applied to find signals of convergent adaptation in humans living at high altitudes (Foll et al. 2014) or in tropical forests (Amorim et al. 2015) and to detect positive selection in ant genomes using the results of the branch-site test (Roux et al. 2014). More recently, we have extended the classical McDonald-Kreitman test (McDonald and Kreitman 1991) to detect more ancient selection signals, i.e. outlier pathways affected by different modes of selection after the split of humans with chimpanzee (Daub et al. 2015). In the present study, we investigate whether one can find traces of positive selection in older periods of human evolution. We use the branch-site likelihood-based test, contrasting codon models with and without positive selection (Zhang et al. 2005). This testing procedure can detect episodic positive selection, and it has been widely used to detect ancient positive selection in various species, including primates and other mammals (Zhang et al. 2005; Bakewell et al. 2007; Kosiol et al. 2008; Studer et al. 2008). We propose here to combine the gene-specific likelihoods of branch-site tests over all members of a gene set, to infer which biological systems have been under positive selection in the primate ancestors of humans. Using this approach we detect signals of adaptation in pathways involved in immune response, sensory perception, metabolism, and energy production. Furthermore, we demonstrate that in many candidate pathways different genes are responsible for the selective signal in different time periods in primate evolution. We have performed a gene set enrichment analysis to detect positive selection at the pathway level in the inner branches of a phylogenetic tree leading to African great apes (Homininae), great apes (Hominidae), apes (Hominoidae), and old world monkeys and apes (Catarrhini) (Figure 1). We first ran separate branch-site tests of positive selection on inner branches of 15,738 protein coding gene trees of the Primates clade. The output of the procedure is a log-likelihood ratio test (ΔlnL) statistic, comparing the likelihood of a model without positive selection to that of a model with one additional parameter for positive selection. If a branch in a gene tree has a high ΔlnL statistic, it means that there is support for the corresponding gene to have a subset of positively selected codons (i.e. dN/dS>1) on this branch. The Primates clade with the species used in the branch-site test. The four tested branches (Homoninae, Hominidae, Hominoidae, and Catarrhini) are numbered (used to identify branch specific lists of genes or gene sets, e.g. G1, G2, G3, G4) and marked in red (modified from http://selectome.unil.ch). 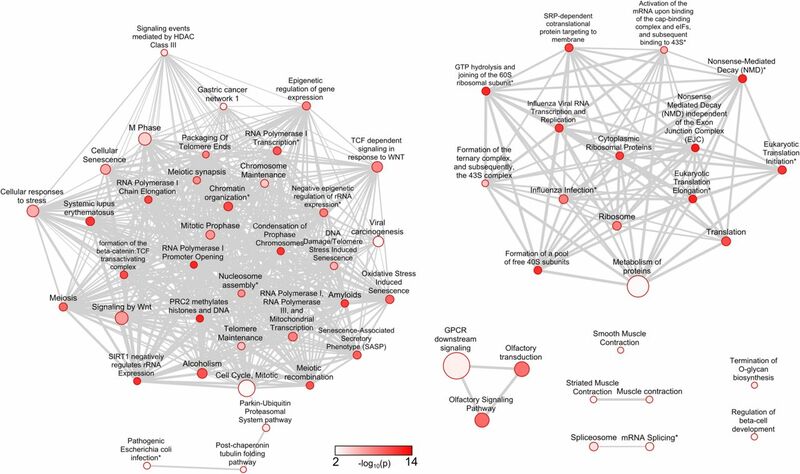 We tested over 1,400 pathways from the Biosystems database (Geer et al. 2010) for episodic positive selection (Table 1). For each pathway and each branch, we calculated the sum of the ΔlnL4 values of the genes in this set (where ΔlnL4 is the fourth root of ΔlnL, see Materials and Methods), and we inferred the significance of this ‘SUMSTAT’ score (Tintle et al. 2009) against a null distribution of random gene sets of the same size. As shown in a previous study on the human specific branch (Daub et al. 2015), we find that genes in gene sets tend to be more conserved in internal branches of the Primates tree than genes that are not included in any gene set. This pattern is most pronounced in the two youngest branches leading to the Homininae and the Hominidae (Supplemental Figure S1). To account for the fact that some genes in sets are more conserved, we created null distributions that explicitly reflect the expected genomic background by randomly sampling from the group of genes that are part of at least one gene set. As we are essentially interested in finding gene sets that show a global shift in selection scores and not those gene sets that include a single or a few extremely significant genes, we repeated the procedure after excluding in each set the highest scoring gene. Only pathways that scored a q-value below 0.2 (thus allowing a 20% FDR) both before and after exclusion of the top significant gene were considered candidates for polygenic selection. Number of gene sets and genes part of sets in the four tested branches. For each branch the number of significant sets (q < 0.2) in the SUMSTAT gene set enrichment test is reported, both before and after removing overlapping genes (‘pruning’), as well as the number of significant sets before pruning that remain significant after removal of their highest scoring gene. We found 6, 32, 42, and 93 such significant pathways in the Homininae, Hominidae, Hominoidae and Catarrhini branches respectively (Table 1 and Supplemental Table S1). The fact that we find more candidate pathways when we go further back in evolutionary history is not necessarily caused by a change of selective pressures, but could be due to an increased power to detect selection in more ancient branches (Studer et al. 2008; Gharib and Robinson-Rechavi 2013). 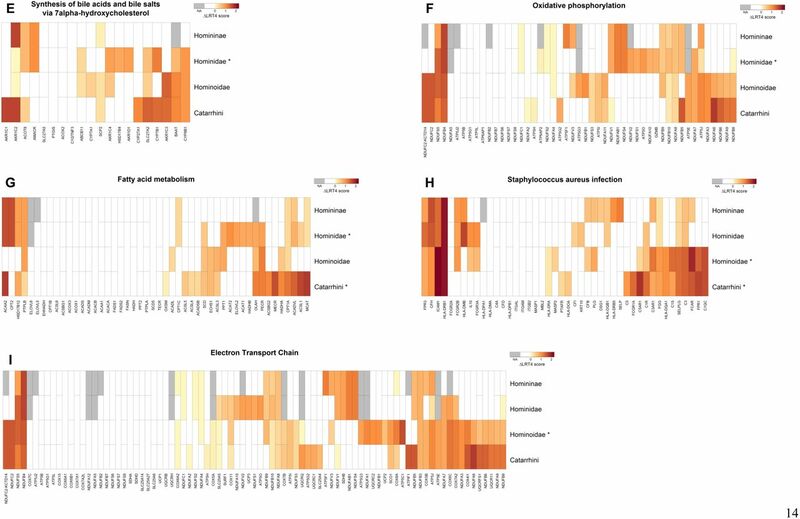 In all four tested branches, we found clusters of candidate pathways that share a considerable proportion of their genes and often have similar biological functions, i.e. which are partially redundant (Supplemental Figures S2 to S5). We removed this redundancy with a ‘pruning’ method, by iteratively removing the genes of the top scoring set from the remaining sets and rerunning the testing procedure on these remaining sets. The pruning procedure considerably reduced the number of significant sets and yielded 2, 7, 6, and 9 independent candidate sets for the Homininae, Hominidae, Hominoidae and Catarrhini branches respectively (Table 2). The strongest candidate for positive selection in the Homininae branch is the GPCR downstream signaling pathway, which is also a top scoring candidate in the Hominoidae branch. G protein-coupled receptors (GPCRs) are membrane proteins that regulate the cellular response to external signals such as neurotransmitters and hormones, and they play an important role in vision, taste and smell (Rosenbaum et al. 2009). The second candidate is the Immunoregulatory interactions between a Lymphoid and a non-Lymphoid cell pathway, which contains receptors and cell adhesion molecules that are important in immune response regulation of lymphocytes. This pathway is also significant after pruning in the Hominidae and Hominoidae branches, and it scores high before pruning in the Catarrhini branch. Results of the SUMSTAT gene set enrichment test. For each branch, only the pathways that score significant (q < 0.2) both before and after pruning (removal of overlapping genes) are listed. The SUMSTAT scores and gene set sizes that changed after pruning are shown in parentheses. Pathways which score significant on more than one branch are highlighted by the symbol ‘§’. Interestingly, the genes in this pathway that contribute most to the polygenic selection signal differ among branches (Figure 2), which suggests that while the same pathway has been under selection over a long time period, different genes underwent adaptive changes at different times. This is a pattern that is shared by many of the significant pathways (Supplemental Figure S6). Heat map showing ΔlnL4 scores of genes in the Immunoregulatory interactions between a Lymphoid and a non-Lymphoid cell pathway for the four tested inner branches of the Primates tree. Branches where the pathway scores significant after pruning are marked with a ‘*’. The genes are grouped by hierarchical clustering to visualize blocks with similar signals within and among branches. Genes for which ΔlnL4 scores were not available (NA) in a certain branch are depicted in grey. Genes are merged (horizontally) with their paralog(s) into an ‘ancestral gene’ in the branches preceding a duplication and their scores were included only once in the calculation of the SUMSTAT score for these branches. Genes with (vertically) merged branches represent cases where the sequence of one or more species is missing or excluded, resulting in a single ‘average’ ΔlnL4 score over multiple branches. We use this score when testing each branch separately. The ΔlnL4 score is computed as the fourth root of log-likelihood ratio in the branch site test for positive selection. The highest scoring candidate in the Hominidae branch is the Olfactory Signaling Pathway, i.e. smell perception. The pathway Metabolism of xenobiotics by cytochrome P450, which ranked third in Hominidae and fifth in Hominoidae, encodes detoxifying proteins which play a role in the metabolism of xenobiotics such as drugs and toxins; they include cytochrome P450 enzymes or glutathione S-transferases. Other candidate pathways are also involved in metabolism, such as the Synthesis of bile acids and bile salts via 7alpha-hydroxycholesterol and Fatty acid metabolism. Note that the latter pathway is also a candidate for positive selection in the Catarrhini branch. The remaining two top scoring pathways in the Hominidae branch are related to immune response (Intestinal immune network for IgA production) and electron transport (Oxidative phosphorylation). In addition to the Immunoregulatory interactions between a Lymphoid and a non-Lymphoid cell pathway, two other immune response pathways remain significant after pruning in the Hominoidae branch. The highest scoring candidate, Staphylococcus aureus infection, includes genes coding for proteins used by the bacterium S. aureus to infect a host cell (Foster 2009). It is also a top candidate in the Catarrhini branch. The Complement cascade pathway plays an important role in immune surveillance and homeostasis (Ricklin et al. 2010). Finally, the last candidate in the Hominoidae branch, Electron Transport Chain, plays a role in energy production. Five out of the nine pathways that remain significant after pruning in the Catarrhini branch have a function in immune response. Apart from the above mentioned Staphylococcus aureus infection, these are Cytokine-cytokine receptor interaction, Hematopoietic cell lineage (giving rise to various types of blood cells including leukocytes), the host defense peptides Defensins, and NF-kB activation through FADD/RIP-1 pathway mediated by caspase-8 and −10. The fourth candidate is Non-alcoholic fatty liver disease (NAFLD), a disease linked with metabolic syndrome (Dowman et al. 2010). Note that before pruning, this latter pathway was part of a cluster of gene sets related to electron transport, a process which – when disturbed – can lead to oxidative stress, which is a key feature of NAFLD pathology. The remaining candidate pathways have functions in the metabolism of toxins (Chemical carcinogenesis) and nutrients (Pancreatic secretion). In this study we have combined the strength of two approaches to detect positive selection in the ancestral lineages of humans. The branch-site test identifies episodes of selection at specific evolutionary times and sites in a protein, and gene set enrichment combines the signal of multiple genes to find selection at the pathway level. 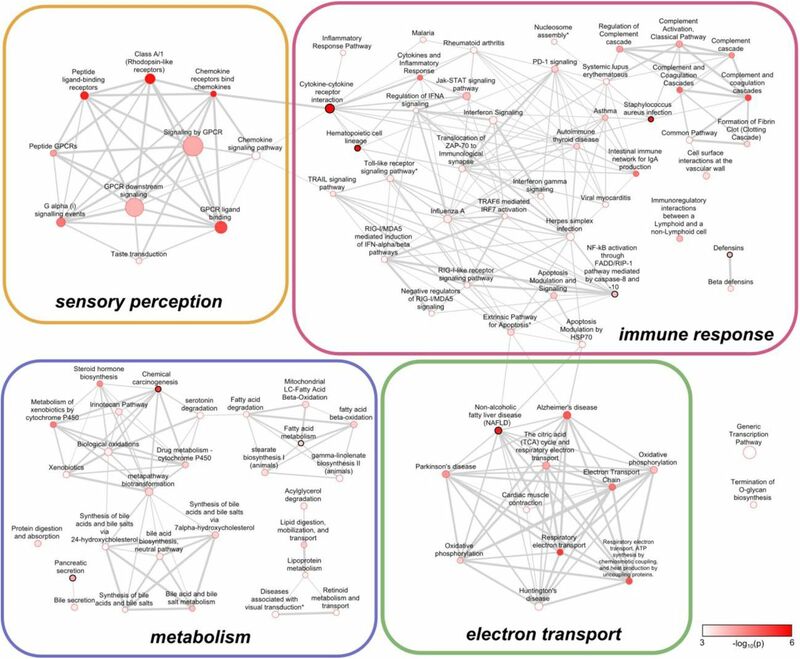 We identified many significant pathways related to immune response, sensory perception, metabolism, and electron transport in different branches of the primate tree (Supplemental Figures S2 to S5). These pathways were often organized in clusters that share many genes and have similar biological functions. After removal of the overlap between these pathways with a pruning procedure, two to nine pathways remained significant per branch. These pathways are our prime candidates for having been shaped by positive selection in primate evolution, and correspond to four broad biological processes. First, in all four tested branches, immune response related pathways were among the top candidates, both before and after pruning. This strong and enduring signal suggests that the ongoing challenge of adaptation to changing pathogens has been one of the major selective pressures in primate evolution. This is in line with similar findings in previous reports of selection or fast evolution in ancient (Chimpanzee Sequencing and Analysis Consortium 2005; Nielsen et al. 2005) and recent human evolution (Daub et al. 2013). Second, several significant pathways are involved in sensory perception, with GPCR downstream signaling and the Olfactory Signaling Pathway remaining after pruning in Homininae and Hominidae respectively. Sensory perception pathways have many functions, from sensing environmental signals to internal signals such as hormones and neurotransmitters. Earlier studies have reported genes involved in sensory perception to be evolving rapidly in humans and other primates (Chimpanzee Sequencing and Analysis Consortium 2005; Nielsen et al. 2005; Arbiza et al. 2006; Kosiol et al. 2008), with at least some evidence for positive selection (Chimpanzee Sequencing and Analysis Consortium 2005; Nielsen et al. 2005; Arbiza et al. 2006; Kosiol et al. 2008), while our gene set study of human-specific evolution found them rather under relaxed selection (Daub et al. 2015). These genes could have been affected by positive selection because of changes in environment, behavior or diet. Third, clusters of significant pathways involved in the metabolism of lipids and other nutrients were detected in Hominidae, Hominoidae and Catarrhini. This selective signal could be explained by changes in diet. Of note, the selective signal could also be due in part to the involvement of some of these pathways (Metabolism of xenobiotics by cytochrome P450 and Chemical carcinogenesis) in the metabolism of potentially toxic xenobiotics. These results are specifically interesting, since adaptations in metabolism are expected with the changes in lifestyle that have marked hominid evolution, but yet have been rarely detected (although see (Mathieson et al. 2015)). The gene set approach thus allows us here to capture a subtle but biologically important signal of adaptation. Fourth, there are several significant pathways involved in energy production in the Hominidae, Hominoidae and Catarrhini branches, with Oxidative phosphorylation, Electron Transport Chain, and Non-alcoholic fatty liver disease (NAFLD) remaining significant after pruning in these branches. Earlier candidate gene studies have also reported genes involved in electron transport to be under positive selection in anthropoid primates (reviewed in Grossman et al. 2004). It has been suggested that this could be related to anthropoid specific evolutionary changes, such as extended lifespan, prolonged fetal development and enlarged neocortex, as these traits require increased aerobic energy production (Grossman et al. 2004). Several pathways reported here were also detected in an earlier study, in which we applied a gene set enrichment analysis on a more recent period of human evolutionary history (Daub et al. 2013). The Cytokine-cytokine receptor interaction pathway for example was detected as a potential candidate for recent polygenic human adaptation. Another candidate in that study, Fatty Acid Beta oxidation, scored significant here before pruning in Catarrhini, as did the Malaria pathway in all branches except Homininae. These findings suggest that certain functions have been under selection in multiple or ongoing episodes of positive selection, and might still be under selection now. The fact that some pathways are significant over successive evolutionary periods (neighboring branches) could indicate that similar selective pressures occurred over a long time frame in primates. Interestingly, we found that in such cases the highest scoring genes often differed among branches (Figure 2 and Supplemental Figure S6), which suggests that biological pathways under long-term selective pressures have adapted by means of changes in different genes over time, allowing to fine tune the function of the pathway without altering previous adaptations. However, we cannot exclude that we might lack power to detect more continuity in selective pressure in the same gene over long evolutionary periods. We have also identified several candidate pathways that are branch-specific. These isolated adaptive signals may be due to unique changes in selective pressure; they might also be due, at least partly, to methodological reasons. As noted above, we find more significant pathways in more ancient lineages, which is probably due to an increased power to evidence selection in older branches, a known property of the branch-site test (Studer et al. 2008; Gharib and Robinson-Rechavi 2013). A potential limitation of our study is that some genes were not present in the Selectome database, as only gene trees with at least six leaves and passing stringent alignment quality filters were included (Moretti et al. 2014). Therefore about 21% of genes were ignored in our enrichment test and we might have a deficit of trees with fast evolving genes that are difficult to align, as well as a potential excess of gene trees with duplications. The latter category contains several paralogs resulting in more leaves, and thus pass the criterion of six leaves even when a few sequences are missing from genomes or eliminated by alignment quality filters. To estimate the effect of this exclusion on our results, we tested for each gene set whether they had a significant excess of excluded genes (q-value < 0.2 with Fisher Exact test). We found 62 gene sets with such an excess (Supplemental Figure S7). These excluded gene sets are mainly involved in protein metabolism (15 sets) and the cell cycle (37 sets). Interestingly, we also find a few gene sets that contain many excluded genes, but still score high in our likelihood-based test, namely the Olfactory signaling, Olfactory transduction and GPCR downstream signaling pathways. Some of the pathways with an excess of excluded genes were candidates for being under selection in studies of recent human evolution, such as Pathogenic Escherichia coli infection (Daub et al. 2013), and we could thus not fully check if these pathways have also been under selection in more ancient primate evolution. We also investigated other non-adaptive factors that might have affected our results, like a very small but significant correlation between ΔlnL scores and gene tree size (number of branches; Pearson’s r = 0.05, p < 2.2e-16) or sequence length (r = −0.01, p = 8e-10). However, we found a more noticeable correlation between ΔlnL scores and branch length (r = 0.24, p < 2.2e-16). This makes sense since the branch length is inferred from the number of mutations, and with increasing numbers of mutations we have more power to detect positive selection, and positive selection can also lead to even more mutations being fixed. So our candidate pathways could be enriched in fast evolving genes, partly because positively selected genes evolve fast, and partly because there is more power to detect selection in fast evolving genes. We want to emphasize that our gene set enrichment analysis is related to but differs from classical Gene Ontology (GO) enrichment tests, as we include all genes in our analysis instead of only considering top scoring genes after setting an arbitrary significance threshold. For comparison we also performed a GO enrichment test on the significant genes in each branch, but this procedure did not result in any significantly enriched GO terms. This negative result underlines the power of a gene set enrichment test as performed in this study, as we are able to detect pathways that contain many genes with small to moderate effect mutations. In conclusion, by combining the specificity of the branch-site test and the power of the gene set approach, we have been able to uncover for the first time strong signals of polygenic positive selection in several biological processes during long-term primate evolution. In addition to immune response, we find evidence for adaptive evolution on sensory perception, as well as on metabolism and energy production. The fact that different genes are involved in pathways showing signals of positive selection in several branches, suggests that the fine tuning of biological functions can change over time during primate evolution. Our results allow us to bridge the gap between studies of selection in deep mammalian evolution, and recent adaptation in the human lineage. In this study we aim at detecting biological pathways affected by episodic positive selection in primate evolutionary history, specifically in the four inner branches of the Primates tree that lead to modern humans (Figure 1). The data used in this study was produced as part of release 6 of Selectome (http://selectome.unil.ch/, Proux et al. 2009; Moretti et al. 2014), which is a database that provides results of the branch-site likelihood test for positive selection (Zhang et al. 2005) on internal branches of several clades. The branch-site test can detect codon sites on specific phylogenetic branches that are affected by episodic positive selection. In short, it estimates the rate of non-synonymous (dN) and synonymous (dS) nucleotide substitutions to assess differences in selective pressure (dN/dS ratio) among branches and over sites. Usually, tested branches that have a class of sites with a dN/dS ratio ω2 > 1 are candidates for positive selection. While the strength of positive selection can in principle be estimated by the ratio ω2 or by the proportion p2 of sites in this class, we have found the likelihood ratio to be a good estimator of the evidence for positive selection (Studer et al. 2008; Roux et al. 2014). In more detail, for each branch, the maximum likelihood of the data is estimated under two models: one that allows for positive selection (H1), and one that only allows negative selection and neutral evolution (H0), and a log-likelihood ratio statistic ΔlnL = 2(lnLH1-lnLH0) is computed. To determine their significance, the ΔlnL values are usually compared to a chi-square (χ2) distribution with one degree of freedom; here we use all ΔlnL values without applying any a priori significance cut-off. Only the internal branches of gene families with at least six sequences (leaves in the tree) were computed in Selectome. For our gene set analysis, we thus used the ΔlnL values obtained by testing 15,738 gene trees from the Primates clade as defined in version 70 of Ensembl Compara (Vilella et al. 2009). We only kept test scores for the four branches mentioned above (and shown in Figure 1) if they led to at least one human gene. We could thus create for each branch i (Figure 1), a list Gi with human genes and their corresponding ΔlnL scores. Because of duplication events and the lack of resolution of the Homininae label, these initial lists often contained several rows per gene, whereas we need at most one ΔlnL score per gene per branch for our enrichment test. On the other hand, missing or excluded sequences can result in branches lacking ΔlnL scores in a number of genes. We describe below how we dealt with these situations and how we handled computational issues with likelihood estimation. 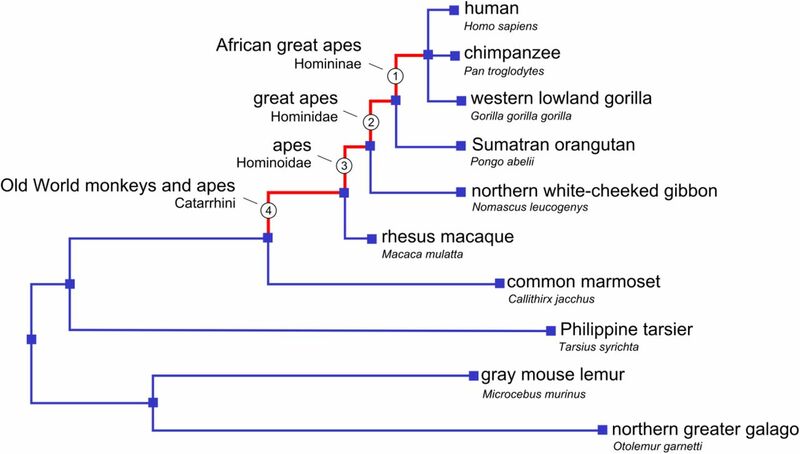 In the Ensembl species tree, the Homininae branch is followed by a trifurcation leading to the human, chimp and gorilla leaves (Figure 1), lacking a label for the Hominini branch that leads to human and chimp. Since the gene trees in Ensembl are always bifurcating, there are many trees that have multiple branches annotated as Homininae. 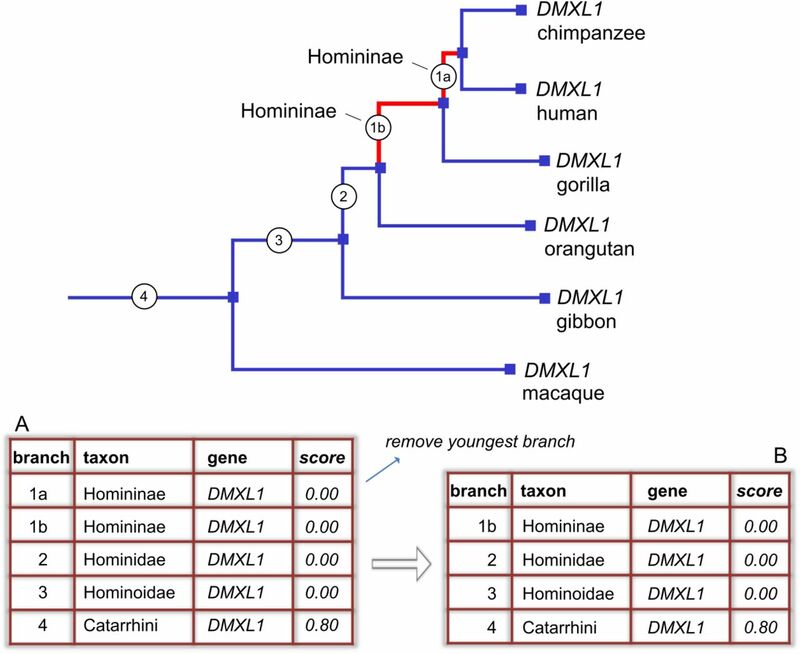 For example, the DMXL1 gene family (Supplemental Figure S8) has a Homininae branch leading to the ancestor of human, chimp and gorilla followed by a branch leading to the ancestor of human and chimp which is labeled “Homininae”, although it is properly an Hominini branch. In about 42% of the gene trees we found such multiple Homininae labeled branches. In these cases we took the test scores of the oldest branch, which in 95% of the cases is also the longest branch. For several genes the sequence of one or more species is absent or excluded due to low quality (Moretti et al. 2014). The corresponding branch in the gene tree is then merged with its downstream branch, and the ΔlnL score is assigned to this lower branch, while it actually represents an ‘average’ score over both branches. We therefore use this ΔlnL score for both branches as input in the gene set enrichment test. Supplemental Figure S9 shows an example of the C3 gene tree with a missing macaque sequence. Supplemental Table S2 shows results of the gene set enrichment test where in the case of a missing sequence, we assign the ΔlnL score only to the lower branch. Gene duplications will result in some species having paralogous genes. For our gene set enrichment analysis we removed the branches in the Primates tree that led to a duplication event (about 3% of all branches). Our procedure is further detailed in Supplemental Figure S10. Briefly, for branches predating the duplication, the values in the gene list corresponding to the duplicated genes, which are redundant (same ancestral branches reported for each paralog), were merged and replaced by one value, while for the branches after the duplication both values were kept, as each represents a different paralog. However, three runs could still allow for some non-convergence. If we obtained a negative ΔlnLg score (indication of non-convergence of all lnLH1 scores) we set ΔlnLg to zero (about 8% of the cases, with less than 0.06% having a ΔlnLg < −0.1). The first branch-site test was run with CODEML version 4.6 from PAML (Yang 2007). Most jobs of the first run were performed on the Swiss multi-scientific computing grid (SMSCG, http://lsds.hesge.ch/smscg/), while the longer jobs were submitted to the Vital-IT computer cluster (http://www.vital-it.ch) and to the Ubelix computer cluster of the university of Berne (http://www.ubelix.unibe.ch/). The second run was run with SlimCodeml (Schabauer et al. 2012), and the third with FastCodeML (Valle et al. 2014) starting with M1-estimated (κ and ω0) starting parameters, both on the Vital-IT computer cluster. We use gene sets from NCBI Biosystems (Geer et al. 2010) (see next section). Since these sets are annotated with Entrez gene IDs, whereas Selectome uses Ensembl gene IDs, we created a one-to-one Ensembl-Entrez conversion table, to map the Ensembl gene IDs in the branch specific gene tables (Gi) to Entrez gene IDs. First, we started with a gene list (Gentrez) containing 20,016 protein coding human genes located either on the autosomal, X or Y chromosomes, downloaded from the NCBI Entrez Gene (Maglott et al. 2011) website (http://www.ncbi.nlm.nih.gov/gene, accessed on July 16, 2014). We further collected conversion tables (often containing one-to-many or many-to-many mappings) from HGNC (http://www.genenames.org/biomart/, accessed on July 16, 2014), NCBI (ftp://ftp.ncbi.nih.gov/gene/DATA, accessed on July 16, 2014), and Ensembl (version 70, http://jan2013.archive.ensembl.org/biomart/martview). We only kept the rows in these conversion tables that contained genes from Gi and from GEntrez. Next, we merged the three tables to one, and only uniquely mapped genes (Ensembl ID - Entrez ID) were used further. For each Ensembl ID we kept the Ensembl-Entrez mapping with the highest count (in case of multiple candidates we chose randomly one) and we then repeated this procedure for each Entrez ID. With this final list of unique one-to-one Ensembl-Entrez ID mappings we translated the Ensembl genes in the Gi tables to Entrez IDs, and unmapped genes were removed. The resulting 14,574, 15,026, 15,375 and 15,450 genes in the tables G1, G2, G3 and G4 respectively were used for further analyses. We downloaded a list of 2,609 human gene sets of type ‘pathway’ from the NCBI Biosystems (Geer et al. 2010) database (http://www.ncbi.nlm.nih.gov/biosystems, accessed on July 16, 2014). The Biosystems database is a repository of gene sets collected from other pathway databases, such as BioCyc (Caspi et al. 2014), KEGG (Kanehisa and Goto 2000; Kanehisa et al. 2014), The National Cancer Institute Pathway Interaction Database (Schaefer et al. 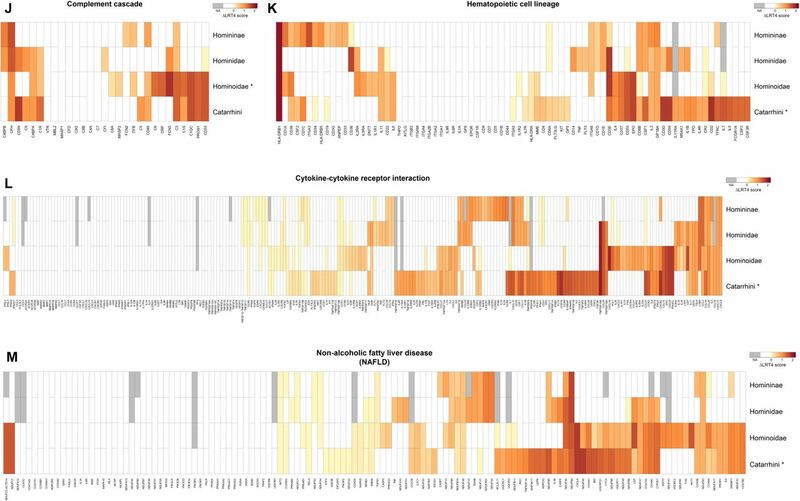 2009), Reactome (Croft et al. 2014) and Wikipathways (Kelder et al. 2012). For each primate branch of interest (Homininae, Hominidae, Hominoidae and Catarrhini) (Figure 1), we excluded genes that could not be mapped to the corresponding gene list Gi (see previous section), then removed gene sets with less than 10 genes, because the gene set enrichment test has low power to detect selection in small sets. We merged groups of nearly identical gene sets (i.e. sets that share 95% or more of their genes) into single gene sets, i.e. the union of all gene sets in these groups. In the text, the name if these union sets is followed by an asterisk (’*’). To distinguish gene sets with identical names, their source database is added to their name. After the filtering process, we obtained S1=1,415, S2=1,424, S3=1,441 and S4=1,441 gene sets for the four branches to be tested for selection with the gene set enrichment analysis (Table 1; numbering according to Figure 1). Note that for each branch we use a different gene list (Gi), leading to a different number of gene sets, as we condition on a minimum of ten genes per set for each branch. The R code to run the gene set enrichment pipeline together with detailed examples and data sets is freely available from https://github.com/CMPG/polysel. at the ith iteration) until we reached a maximum of 1,000,000 randomizations. We have considered using a parametric distribution, as we know from theory and simulation studies (Zhang et al. 2005) that under the null hypothesis the log-likelihood ratios in the branch-site test should be distributed as a mixture of 50% zeros and 50% a χ2 distribution with one degree of freedom. Assuming such a distribution, we can infer the expected null distribution of a log-likelihood ratio score at the gene set level as well. However, in our real data the proportion of zeros is much larger (70%-80%), and we observed that a parametric null distribution produces a skewed distribution of p-values, leading to an overestimation of p-values (see also Supplemental Text S1) and thus an under-estimation of the signal for positive selection. Therefore we have favored the use of an empirical distribution. Gene sets can potentially have a high SUMSTAT score due solely to one gene with an extremely high ΔlnL value. However, we are interested here in gene sets affected by polygenic selection, where multiple genes have moderately high selection scores. Therefore, we also tested the gene sets after removing their highest scoring gene, and contrasted their SUMSTAT score against random sets that also had their top scoring gene removed. Those gene sets that were not scoring significant anymore after this test were not included in further analyses. The gene set enrichment test can result in partially redundant gene sets being called significant, because they share high scoring genes, and BioSystems includes overlapping or redundant sets. We therefore removed the overlap between gene sets with a ‘pruning’ method similar to one we described in a previous study (Daub et al. 2013). In short, we removed for each branch the genes of the most significant pathway from all the other pathways, and ran the enrichment test on these updated gene sets. We repeated this pruning procedure until no sets were left to be tested. (p*) from the mean proportion of gene sets in the randomized data sets with p-value ≤ p*. The q-value was finally determined by taking the lowest estimated FDR among all observed p-values ≥ p*. We reported the gene sets that scored significant (q-value < 0.2) both before and after pruning. To contrast our results with a classical Gene Ontology (GO) enrichment test, we defined for each branch a list of top scoring genes, namely those genes with a ΔlnL value resulting in a q-value < 0.2 when compared against a null distribution consisting of 50% zeros and 50% χ2 with one degree of freedom (see paragraph ‘Empirical null distribution’ and Zhang et al. 2005). Note that this is a much less conservative score compared to the branches reported on the Selectome website, as the latter are based on q < 0.10 and were computed over all branches and trees using a more conservative null distribution (χ2 with one degree of freedom). The top genes thus defined were used as input for the online tool Fatigo (http://babelomics.bioinfo.cipf.es, (Al-Shahrour et al. 2004)). We tested for enrichment in (level 3-9) GO biological processes and molecular functions using as background the gene lists Gi. The resulting p-values were corrected for multiple testing by calculating the q-value per branch and GO category (biological process and molecular function), where q-values < 0.2 were considered significant. Since all gene trees with less than six leaves after removing unreliably aligned sequences were excluded in Selectome, we tested which categories of gene sets where enriched with these excluded genes, and were thus unlikely to show significant results in our gene set enrichment test. For this we performed for each gene set a Fisher’s exact test on a contingency table with the counts of included and excluded genes in the set contrasted against the same counts for the rest of the genes in Gentrez, the list of genes downloaded from the NCBI Entrez website. The resulting p-values were corrected for multiple tests, and gene sets with a q-value < 0.2 were reported. For all tests (except when inferring significance after pruning), we calculated the q-value (Storey J. D. and Tibshirani 2003; Storey John D. et al. 2004) as a measure of the false discovery rate using the R package qvalue (with parameter pi0.method set to “bootstrap”) and reported those gene sets with a q-value < 0.2. The enrichment maps (Supplemental Figures S2 to S5 and S7) were created in Cytoscape v. 2.8.3 with the Enrichmentmap plugin (Merico et al. 2010). Daub, J.T., Moretti, S., Davidov, I. I., Excoffier, L. Robinson-Rechavi, M.
This ΔlnLs score can then be compared against a parametric null distribution to infer its significance. This table is a separate excel file (TableS1.xlsx) which contains three tables: (A) Top scoring gene sets in the gene set enrichment test before pruning, their rank and score and p- and q-value (also after leaving out the highest scoring gene). All gene sets with q<0.2 are reported. (B) All significantly scoring pathways and their rank (before pruning) in all four branches. An ‘-’ indicates that the set was not defined in that particular branch. Gene sets that scored significant after pruning are marked in bold. (C) Genes in top scoring gene sets and their ΔlnL4 and ΔlnL scores. This table is a separate excel file (TableS2.xlsx) presenting results of the gene set enrichment test where missing branches were not given the ΔlnL4 score of their child branch. It contains three tables: The number of available genes and gene sets for each branch excluding or including missing branches (using the ΔlnL4 score of their child branch) (A), and two tables with top scoring gene sets in the enrichment test before (B) and after (C) pruning, their rank and score and p- and q-value. All gene sets with q-value<0.2 are reported. Proportion (A) and distribution (B) of non-zero ΔlnL4 scores in the genes in the four tested branches, split between genes that are not part of a gene set and genes that are part of at least one gene set. 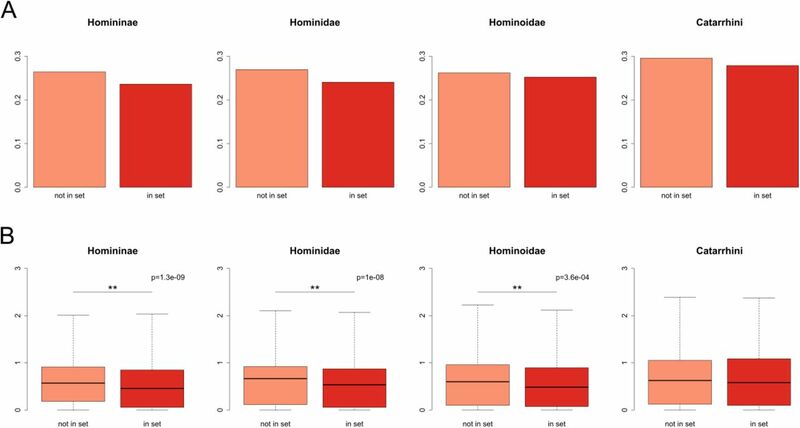 Especially the Homininae and Hominidae branches show a lower proportion and lower values of non-zero scores for genes in sets. The significance of the difference in distributions of non-zero ΔlnL4 scores is tested with a Wilcoxon signed-rank test. Enrichment map of the gene sets enriched for signals of positive selection in the Homininae branch. The nodes represent the 6 pathways with q-values < 0.2 before pruning (removal of overlapping genes). The node color scale represents gene set p-values. Edges represent mutual overlap; nodes are connected if one of the sets has at least 33% of its genes in common with the other gene set. The widths of the edges scale with the similarity between nodes. The two pathways that remained significant after pruning are marked with a black circle. A full-size version of this figure is available at https://dx.doi.org/10.6084/m9.figshare.3119029. Enrichment map of the gene sets enriched for signals of positive selection in the Hominidae branch. The nodes represent the 32 pathways with q-values < 0.2 before pruning (removal of overlapping genes). The seven pathways that remained significant after pruning are marked with a black circle. See Figure S2 for a more detailed explanation of the enrichment map. Nodes marked with * represent unions of pathways that share more than 95% of their genes. A full-size version of this figure is available at https://dx.doi.org/10.6084/m9.figshare.3119029. Enrichment map of the gene sets enriched for signals of positive selection in the Hominoidae branch. The nodes represent the 42 pathways with q-values < 0.2 before pruning (removal of overlapping genes). The six pathways that remained significant after pruning are marked with a black circle. See Figure S2 for a more detailed explanation of the enrichment map. A full-size version of this figure is available at https://dx.doi.org/10.6084/m9.figshare.3119029. Enrichment map of the gene sets enriched for signals of positive selection in the Catarrhini branch. The nodes represent the 93 pathways with q-values < 0.2 before pruning (removal of overlapping genes). The nine pathways that remained significant after pruning are marked with a black circle. See Figure S2 for a more detailed explanation of the enrichment map. Nodes marked with * represent unions of pathways that share more than 95% of their genes. A full-size version of this figure is available at https://dx.doi.org/10.6084/m9.figshare.3119029. 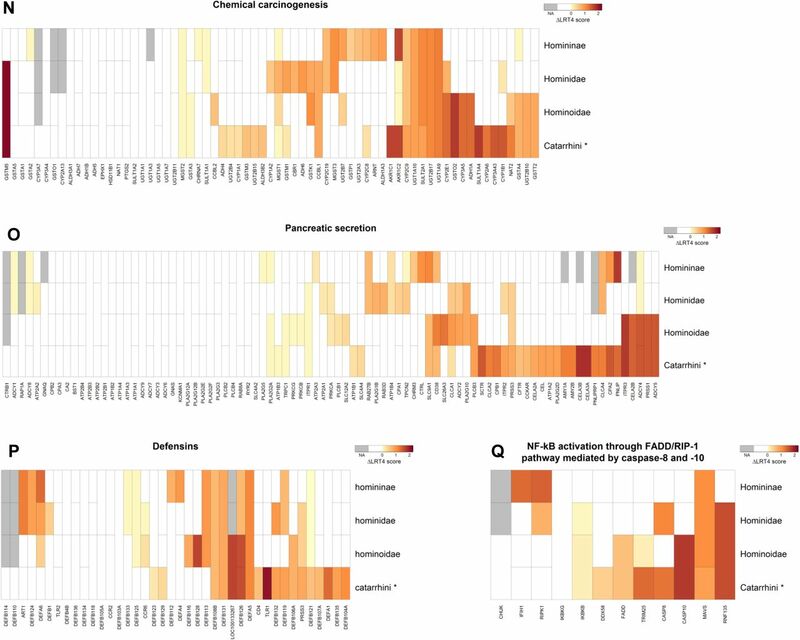 Heat maps showing branch specific ΔlnL4 scores of genes in pathways that score significant (q < 0.2) in the gene set enrichment test after pruning. The ΔlnL4 score is computed as the fourth root of the log-likelihood ratio in the branch site test for positive selection. Branches where a pathway scores significant are marked with a ‘*’. The genes are grouped by hierarchical clustering to visualize blocks with similar signals among branches. Genes for which ΔlnL4 scores were not available (NA) in a certain branch are depicted in grey. Genes are merged (horizontally) with their paralog(s) into an ‘ancestral gene’ in the branches preceding a duplication and their scores were included only once in the calculation of the SUMSTAT score for these branches. Genes with (vertically) merged branches represent cases where the sequence of one or more species is missing or excluded, resulting in a single ‘average’ ΔlnL4 score over multiple branches. We used this score when testing each branch separately. Full-size versions of these heat maps are available at https://dx.doi.org/10.6084/m9.figshare.3119026. Enrichment map of gene sets enriched with genes that were excluded in Selectome. The nodes represent the 62 pathways with q-values < 0.2 in a Fisher’s exact test. See Figure S2 for a more detailed description of the enrichment map. Nodes marked with * represent unions of pathways that share more than 95% of their genes. A full-size version of this figure is available at https://dx.doi.org/10.6084/m9.figshare.3119122. Example of multiple Homininae branches (branch 1a and 1b, marked red) in the DMXL1 gene tree. Only the oldest branch (1b) will be used in the enrichment test. Table A illustrates that initially the Hominae branches occur in double in the table, while after removing the youngest Homininae branch, only one row per branch (taxon) and human gene remains (Table B). It should be emphasized that this is not a biological phenomenon, but simply a technical result of the labeling choices made in the Ensembl database, which are carried into the Selectome database and thus into the dataset used in this study. Example of a missing branch (Catarrhini) in the CE3 gene tree, due to an absent or low quality macaque sequence for this gene. The score assigned to the Hominoidae branch actually represents an ‘average’ score for both the Hominoidae and Catarrhini branch, and therefore we use this score for both branches in the enrichment test. 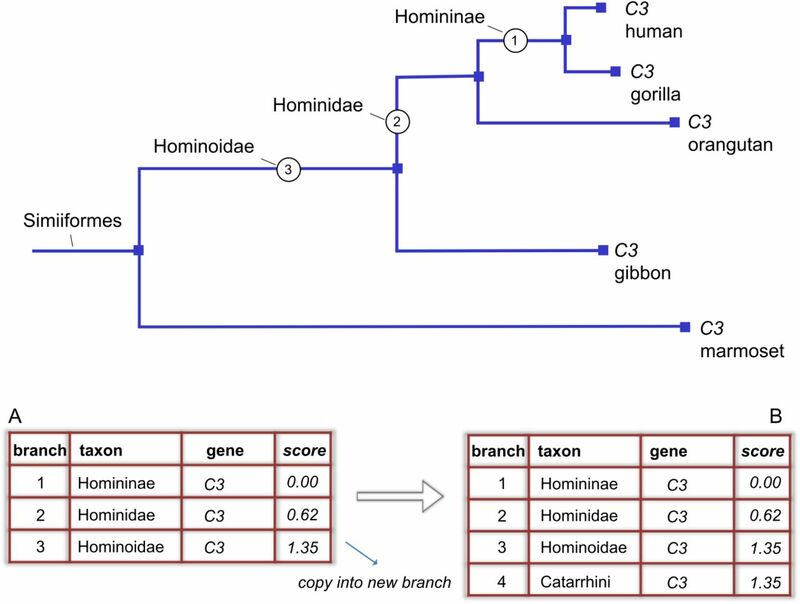 Table A illustrates that initially one branch is missing, while after copying the Hominoidae score into a new Catarrhini row, one row per branch (taxon) and human gene is now available (Table B). Example of a duplication event (red node) in the Hominidae branch of the CYP4A11/CYP4A22 gene tree. 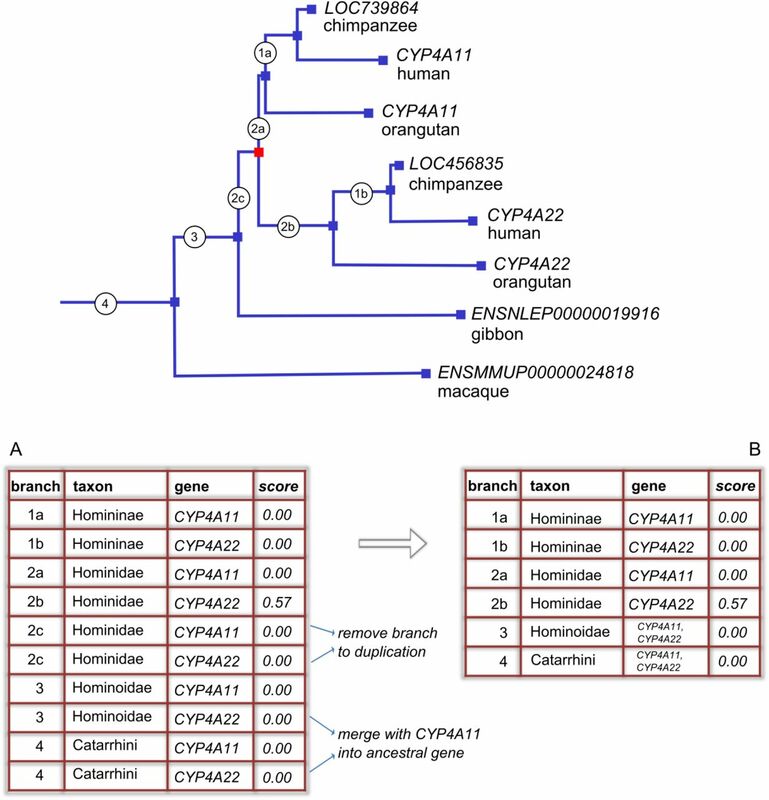 In the enrichment tests (i) the branch leading to the duplication (2c) is removed and (ii) in the Hominoidae (3) and Catarrhini branch (4), the ‘ancestral’ gene CYP4A11, CYP4A22 replaces the two human paralogs CYP4A11 and CYP4A22. Table A illustrates that initially some branches (and their scores) occur in double in the table. After merging and removing branches, only one row per branch (taxon) and human gene remains (Table B). This work was supported by the Swiss National Science Foundation (grant numbers PDFMP3-130309 to LE and 31003A_153341 and CR32I3_143768 to MRR). The computations were performed at the Vital-IT (http://www.vital-it.ch) Center for high-performance computing of the SIB Swiss Institute of Bioinformatics, on the Ubelix HPC cluster of the University of Bern and on the Swiss Multi-Science Computing Grid. Ahrens JH, Dieter U. 1985. Sequential random sampling. ACM Trans Math Softw 11:157–169. Al-Shahrour F, Diaz-Uriarte R, Dopazo J. 2004. FatiGO: a web tool for finding significant associations of Gene Ontology terms with groups of genes. Bioinformatics 20:578–580. Amorim CE, Daub JT, Salzano FM, Foll M, Excoffier L. 2015. Detection of convergent genome-wide signals of adaptation to tropical forests in humans. PLoS One 10:e0121557. Anisimova M, Yang Z. 2007. Multiple Hypothesis Testing to Detect Lineages under Positive Selection that Affects Only a Few Sites. Mol Biol Evol 24:1219–1228. Arbiza L, Dopazo J, Dopazo H. 2006. Positive selection, relaxation, and acceleration in the evolution of the human and chimp genome. PLoS Comput Biol 2:e38. Bakewell MA, Shi P, Zhang J. 2007. More genes underwent positive selection in chimpanzee evolution than in human evolution. Proc Natl Acad Sci U S A 104:7489–7494. Berg JJ, Coop G. 2014. A population genetic signal of polygenic adaptation. PLoS Genet 10:e1004412. Carneiro M, Rubin CJ, Di Palma F, Albert FW, Alfoldi J, Barrio AM, Pielberg G, Rafati N, Sayyab S, Turner-Maier J et al. 2014. Rabbit genome analysis reveals a polygenic basis for phenotypic change during domestication. Science 345:1074–1079. Caspi R, Altman T, Billington R, Dreher K, Foerster H, Fulcher CA, Holland TA, Keseler IM, Kothari A, Kubo A et al. 2014. The MetaCyc database of metabolic pathways and enzymes and the BioCyc collection of Pathway/Genome Databases. Nucleic Acids Res 42:D459–471. Chimpanzee Sequencing and Analysis Consortium. 2005. Initial sequence of the chimpanzee genome and comparison with the human genome. Nature 437:69–87. Croft D, Mundo AF, Haw R, Milacic M, Weiser J, Wu G, Caudy M, Garapati P, Gillespie M, Kamdar MR et al. 2014. The Reactome pathway knowledgebase. Nucleic Acids Res 42:D472–477. Daub JT, Dupanloup I, Robinson-Rechavi M, Excoffier L. 2015. Inference of Evolutionary Forces Acting on Human Biological Pathways. Genome Biol Evol 7:1546–1558. Daub JT, Hofer T, Cutivet E, Dupanloup I, Quintana-Murci L, Robinson-Rechavi M, Excoffier L. 2013. Evidence for Polygenic Adaptation to Pathogens in the Human Genome. Molecular Biology and Evolution 30:1544–1558. Delport W, Scheffler K, Seoighe C. 2009. Models of coding sequence evolution. Brief Bioinform 10:97–109. Dowman JK, Tomlinson JW, Newsome PN. 2010. Pathogenesis of non-alcoholic fatty liver disease. QJM 103:71–83. Foll M, Gaggiotti OE, Daub JT, Vatsiou A, Excoffier L. 2014. Widespread signals of convergent adaptation to high altitude in Asia and america. Am J Hum Genet 95:394–407. Foster TJ. 2009. Colonization and infection of the human host by staphylococci: adhesion, survival and immune evasion. Vet Dermatol 20:456–470. Fraser HB. 2013. Gene expression drives local adaptation in humans. Genome Res 23:1089–1096. Geer LY, Marchler-Bauer A, Geer RC, Han L, He J, He S, Liu C, Shi W, Bryant SH. 2010. The NCBI BioSystems database. Nucleic Acids Res 38:D492–496. Gharib WH, Robinson-Rechavi M. 2013. The Branch-Site Test of Positive Selection Is Surprisingly Robust but Lacks Power under Synonymous Substitution Saturation and Variation in GC. Molecular Biology and Evolution 30:1675–1686. Gibbs RA, Rogers J, Katze MG, Bumgarner R, Weinstock GM, Mardis ER, Remington KA, Strausberg RL, Venter JC, Wilson RK et al. 2007. Evolutionary and biomedical insights from the rhesus macaque genome. Science 316:222–234. Grossman LI, Wildman DE, Schmidt TR, Goodman M. 2004. Accelerated evolution of the electron transport chain in anthropoid primates. Trends Genet 20:578–585. Hawkins DM, Wixley RAJ. 1986. A Note on the Transformation of Chi-Squared Variables to Normality. American Statistician 40:296–298. Kanehisa M, Goto S. 2000. KEGG: kyoto encyclopedia of genes and genomes. Nucleic Acids Res 28:27–30. Kanehisa M, Goto S, Sato Y, Kawashima M, Furumichi M, Tanabe M. 2014. Data, information, knowledge and principle: back to metabolism in KEGG. Nucleic Acids Res 42:D199–205. Kelder T, van Iersel MP, Hanspers K, Kutmon M, Conklin BR, Evelo CT, Pico AR. 2012. 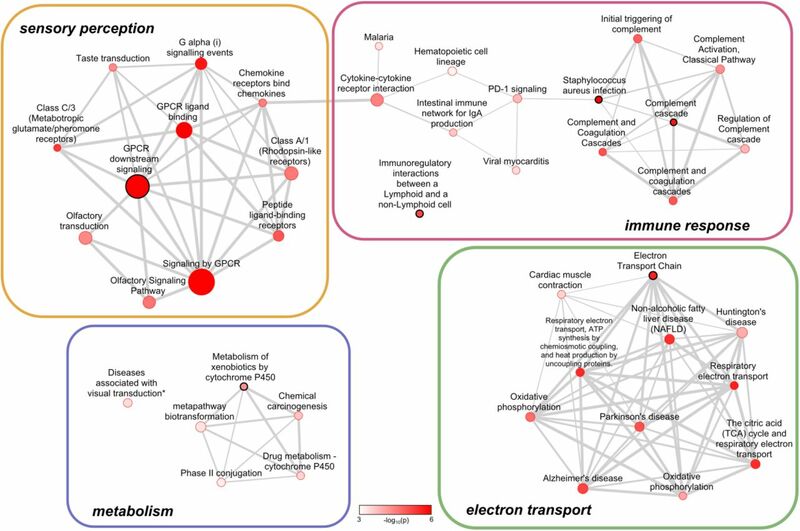 WikiPathways: building research communities on biological pathways. Nucleic Acids Res 40:D1301–1307. Kosiol C, Vinar T, da Fonseca RR, Hubisz MJ, Bustamante CD, Nielsen R, Siepel A. 2008. Patterns of positive selection in six Mammalian genomes. PLoS Genet 4:e1000144. Lachance J, Tishkoff SA. 2013. Population Genomics of Human Adaptation. Annu Rev Ecol Evol Syst 44:123–143. Maglott D, Ostell J, Pruitt KD, Tatusova T. 2011. Entrez Gene: gene-centered information at NCBI. Nucleic Acids Res 39:D52–57. Mathieson I, Lazaridis I, Rohland N, Mallick S, Patterson N, Roodenberg SA, Harney E, Stewardson K, Fernandes D, Novak M et al. 2015. Genome-wide patterns of selection in 230 ancient Eurasians. Nature 528:499–503. McDonald JH, Kreitman M. 1991. Adaptive protein evolution at the Adh locus in Drosophila. Nature 351:652–654. Merico D, Isserlin R, Stueker O, Emili A, Bader GD. 2010. Enrichment map: a network-based method for gene-set enrichment visualization and interpretation. PLoS One 5:e13984. Moretti S, Laurenczy B, Gharib WH, Castella B, Kuzniar A, Schabauer H, Studer RA, Valle M, Salamin N, Stockinger H et al. 2014. Selectome update: quality control and computational improvements to a database of positive selection. Nucleic Acids Res 42:D917–921. Nielsen R, Bustamante C, Clark AG, Glanowski S, Sackton TB, Hubisz MJ, Fledel-Alon A, Tanenbaum DM, Civello D, White TJ et al. 2005. A scan for positively selected genes in the genomes of humans and chimpanzees. PLoS Biol 3:e170. Proux E, Studer RA, Moretti S, Robinson-Rechavi M. 2009. Selectome: a database of positive selection. Nucleic Acids Res 37:D404–407. Ricklin D, Hajishengallis G, Yang K, Lambris JD. 2010. Complement: a key system for immune surveillance and homeostasis. Nat Immunol 11:785–797. Rosenbaum DM, Rasmussen SG, Kobilka BK. 2009. The structure and function of G-protein-coupled receptors. Nature 459:356–363. Roux J, Privman E, Moretti S, Daub JT, Robinson-Rechavi M, Keller L. 2014. Patterns of positive selection in seven ant genomes. Mol Biol Evol 31:1661–1685. Schabauer H, Valle M, Pacher C, Stockinger H, Stamatakis A, Robinson-Rechavi M, Ziheng Y, Salamin N. 2012. SlimCodeML: An Optimized Version of CodeML for the Branch-Site Model. Pp. 706–714. Parallel and Distributed Processing Symposium Workshops & PhD Forum (IPDPSW), 2012 IEEE 26th International. Schaefer CF, Anthony K, Krupa S, Buchoff J, Day M, Hannay T, Buetow KH. 2009. PID: the Pathway Interaction Database. Nucleic Acids Res 37:D674–679. Serra F, Arbiza L, Dopazo J, Dopazo H. 2011. Natural selection on functional modules, a genome-wide analysis. PLoS Comput Biol 7:e1001093. Storey JD, Taylor JE, Siegmund D. 2004. Strong control, conservative point estimation and simultaneous conservative consistency of false discovery rates: a unified approach. Journal of the Royal Statistical Society: Series B (Statistical Methodology) 66:187–205. Storey JD, Tibshirani R. 2003. Statistical significance for genomewide studies. Proc Natl Acad Sci U S A 100:9440–9445. Studer RA, Penel S, Duret L, Robinson-Rechavi M. 2008. Pervasive positive selection on duplicated and nonduplicated vertebrate protein coding genes. Genome Res 18:1393–1402. Tintle NL, Borchers B, Brown M, Bekmetjev A. 2009. Comparing gene set analysis methods on single-nucleotide polymorphism data from Genetic Analysis Workshop 16. BMC Proceedings 3 Suppl 7:S96. Valle M, Schabauer H, Pacher C, Stockinger H, Stamatakis A, Robinson-Rechavi M, Salamin N. 2014. Optimization strategies for fast detection of positive selection on phylogenetic trees Bioinformatics 30: 1129–1137. Vilella AJ, Severin J, Ureta-Vidal A, Heng L, Durbin R, Birney E. 2009. EnsemblCompara GeneTrees: Complete, duplication-aware phylogenetic trees in vertebrates. Genome Res 19:327–335. Wellenreuther M, Hansson B. 2016. Detecting Polygenic Evolution: Problems, Pitfalls, and Promises Trends in Genetics 32: 155–164. Yang Z. 2007. PAML 4: phylogenetic analysis by maximum likelihood. Mol Biol Evol 24:1586–1591. Zhang J, Nielsen R, Yang Z. 2005. Evaluation of an improved branch-site likelihood method for detecting positive selection at the molecular level. Mol Biol Evol 22:2472–2479. Ota R, Waddell PJ, Hasegawa M, Shimodaira H, Kishino H. 2000. 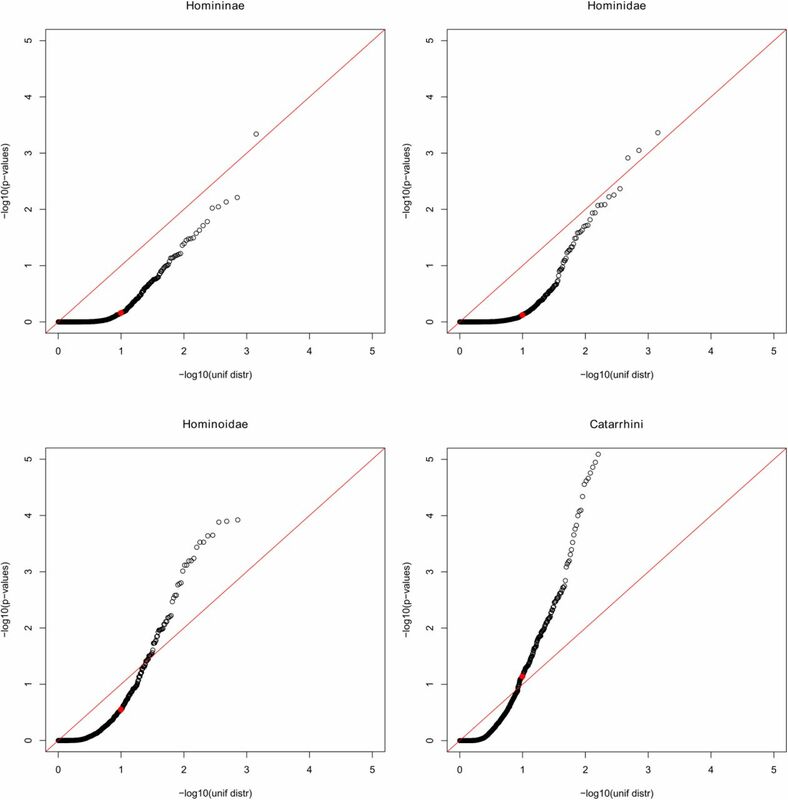 Appropriate likelihood ratio tests and marginal distributions for evolutionary tree models with constraints on parameters. Mol Biol Evol 17:798–803. Self SG, Liang KY. 1987. Asymptotic Properties of Maximum-Likelihood Estimators and Likelihood Ratio Tests under Nonstandard Conditions. Journal of the American Statistical Association 82:605–610.